Mill Park graduates enjoyed a stakes double over the weekend with progressive mare Gogo Grace taking out the Group III Bow Mistress Stakes in Tasmania on Friday, while exciting three year-old filly Booker returned from a summer break to score a dominant win in the Group III MRC Kevin Hayes Stakes at Caulfield. The Group 1 MRC Oakleigh Plate is in the sights of the big-hearted Booker after the three-year-old daughter of Written Tycoon defied all challengers to win the 1200 metre sprint by a length and a half. Racing for the first time since finishing unplaced in the Group I MRC Thousand Guineas over 1600m last October after winning the Group II MRC Thousand Guineas Prelude at her previous start, Booker advanced her record to three wins and three placings from seven starts with earnings of $393,750. "Today was a terrific win and the Oakleigh Plate is the aim," said co-trainer Matt Ellerton, who prepares the filly with Simon Zahra. "She should get in with no weight, the problem will be getting a run. "Dwayne (Dunn) was able to control the race from the front today and she cornered terrific. "She's strengthened from the spring and is an impressive filly now, she's like a colt." A $230,000 purchase by part-owner Barry Griffith from the Mill Park Stud draft at the 2016 Inglis Premier Yearling sale, Booker is the first foal of the winning Flying Spur mare Noondie who is a half-sister to stakes-winner Tranquillity out of stakes-winner Creatrix from the family of Group I winner Umrum. Mill Park sold the yearling full brother (pictured below) to Booker at the recent Magic Millions for $600,000 to Bruce Perry Bloodstock. She foaled a Starspangledbanner colt last spring and was bred back to Written Tycoon's Golden Slipper-winning son Capitalist. A homebred for Harry Perks that was raised at Mill Park, Gogo Grace is prepared by Leon Macdonald and Andrew Gluyas. The four year-old daughter of New Approach (IRE) had won four previous races in Adelaide, but her win in the Group III Bow Mistress Stakes (1200m) was her first in a Black Type race. She is the best of two winners from stakes-winner Starmon, whose third dam Cotehele House (GB) is renowned as the dam of Danewin and Commands with other descendants including Group I winners Emerald Dream, Luna Rossa, Shooting to Win and his Group II winning full brother Deep Field. 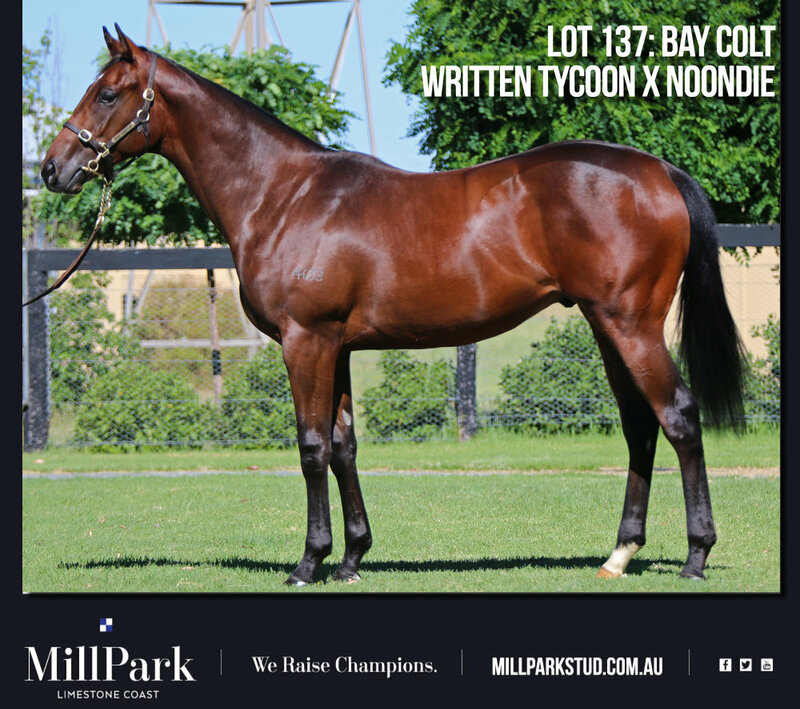 The next yearling sale for Mill Park is Inglis Premier where 14 lots are consigned including a Sebring colt from outstanding producer Madame Flurry, the dam of six winners headed by triple Group I winner and $3million earner Happy Trails, Group III winner Danish Twist and this season's stakes-winning three year-old All Too Huiying. Click here to see the draft.